We are thorough, knowledgeable and experienced certified laser technicians providing you with safe, professional treatments on all areas of the body, all skin types and all genders. We use the most advanced laser technology to provide you with comfortable, effective and efficient laser hair removal treatments. Get started today for a hair free tomorrow! Laser hair removal continues to be a popular choice for permanent hair reduction of unwanted hair, among all genders of all age groups. At Fresh Laser Skin Studio, we offer a private, professional and comfortable setting for hair removal on all skin types, all genders and on all areas of the body. We are proud to offer you the newest most advanced and comfortable technology available today, as well as the best trained laser technicians in the industry! Up-to-date laser technology – using the correct laser wavelength, not IPL ( which is sometimes mistakenly called a laser). A thorough, trained and experienced operator to set and change the parameters according to the hair colour, thickness, density, skin type and last but not least, comfort level. Consistent scheduled appointments to ensure treatment of the greatest percentage of hair in the active growth phase. When all of the above factors are met, you can expect a minimum of 75% permanent hair reduction after your 6th treatment, for most areas. * Some exceptions may apply depending on individual medical conditions. Our advanced laser technologies are specific for laser hair removal and provide the necessary versatility required to treat all skin types, as well as customization for hair thickness, density and colour. We have 2 Vectus lasers to better serve our clients. 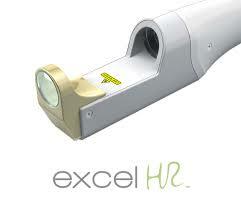 To keep the most up to date with our technology, we recently added the Cutera Excel HR Laser. This is the only high performance and versatile laser offering sapphire contact cooling for both the Alexandrite 755nm λ laser and the Nd:Yag 1064 nm λ. It not only provides safe and effective treatments, but its also the most comfortable Alexandrite and Nd:Yag hair removal laser on the market today! Built in adjustable spot size ranging from 3mm to 18mm, allowing for effective treatment of all hair densities on all skin types, even tanned skin! Cutera is recognized as a world leader in 1064nm technology and is the only truPulse™ 1064nm laser on the market. This technology provides consistent levels of energy, enabling greater depths of penetration and lower melanin absorption. Ideal for darker or tanned skin. The sapphire lens provides improved efficacy as it minimizes light bending (refraction) and ensures more laser light reaches the target. What laser hair removal systems are available today? The gold standard for laser hair removal or reduction for Fitzpatrick Skin Types I – III. Treatment areas must not have unprotected sun exposure or tanning within one month of the first laser treatment and throughout the remaining laser treatments. The only gold standard for laser hair removal or reduction for Fitzpatrick Skin Types IV – VI and tanned skin. Treatment area must not have unprotected sun exposure or tanning within 3 to 7 days prior to the first laser treatment and throughout the remaining laser treatments. The latest gold standard diode laser technology on the market today. Providing the most uniform beam profile allowing for more comfortable and effective laser hair removal treatments today. A high speed gold standard wavelength enabling laser hair removal or reduction for Fitzpatrick Skin Types I – VI. Fast, effective and best of all it is easily tolerated. The most comfortable laser treatment compared to all other diode lasers! Treatment area must not have unprotected sun exposure or tanning within 2-3 weeks of the first laser treatment and throughout the remaining laser treatments. Also considered a gold standard wavelength for laser hair removal or reduction for Fitzpatrick Skin Types I – III. Skin Type IV may be treated with caution. 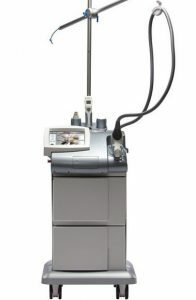 The large hand piece of this Diode laser is divided into 3 sections, allowing for less uniform delivery of energy and is not as efficient and comfortable as the Vectus Diode laser. Treatment area must not have unprotected sun exposure or tanning within one month of the first laser treatment and throughout the remaining laser treatments. Intense Pulsed Light (Broad Band Light & Xenon Pulsed Light) , commonly called, or mistaken as, a Laser. Not a gold standard for hair removal and is not as effective at permanent hair removal as a laser. IPL is not safe to use on skin types IV-VI. What is the difference between laser & IPL? A laser is a highly powered light source providing a single wavelength for absorption of a specific structure or pigment (eg. melanin in hair). IPL – Intense Pulsed Light, also known as BBL & XPL (Broad band Light & Xenon Pulsed Light) is commonly called, or mistaken as, a Laser. IPL is a very intense flash of light (similar to a flashlight), coupled with filters that block out light from a particular spectral range. Consequently, the output of an IPL system has a varying range of wavelengths with varying average power along any given range of wavelengths. The light tends to scatter and is not specific to a particular target. Therefore IPL is not highly recommended for hair removal treatments, as the light may not be absorbed by the target (melanin in hair). Many treatments are necessary and results are variable. If IPL is chosen for hair removal or reduction, it is typically safe for Fitzpatrick Skin Types I – III , although it is not the method of choice. IPL is commonly used for treating photo-aging skin (scattered red and brown pigment), commonly known as a Photo Facial or Photo Rejuvenation. Fresh Laser only uses advanced laser technology for all photo rejuvenation treatments, as well as hair removal treatments. Laser technology has specific targets and is very effective and much safer than an IPL device. What is a Fitzpatrick Skin Type Classification? A Fitzpatrick Skin Type is a numerical value assigned to classify your skin colour. It was developed in 1975 by Thomas Fitzpatrick, MD, PhD. as a way to estimate the response of different types of skin to UV (ultraviolet light). The scale ranges from very fair (Skin Type I) to very dark (Skin Type VI) and takes into account three main factors: Genetic disposition, reaction to sun exposure and tanning habits, which all influence your skin type and ultimately the correct selection of laser wavelength and parameters, for safe and successful treatments. The Fitzpatrick Skin Type scale is still the most widely used system today by skin care professionals to help determine how someone will respond/react to skin treatments and focuses on potentials for irritations such as burns and hyperpigmentation, which helps us to determine the right treatment choices for you. At Fresh Laser Skin Studio we include a questionnaire with your initial visit/consultation, to calculate your Fitzpatrick skin type. Selective phototherrmolysis is the technology used today for laser hair removal systems. The laser produces a single wavelength (laser light energy) that is selectively absorbed by a specific chromophore (colour bearing target). This results in the damage or destruction of the chromophore (melanin in hair) and the tissue it occupies (reproductive cells), while maintaining the integrity of the surrounding tissue. Is it effective for all hair colours? Only hair that has colour will contain enough melanin (chromophore) to attract the laser light energy. Therefore, laser hair removal will not be effective on blonde, white and gray hair. Red hair is variable and may not work, a test spot is recommended first. This varies depending on the system used (type of laser or IPL), area to be treated and the growth phase of the hair follicle. We have the ability to customize all treatments and use multiple laser wavelengths when necessary, ensuring the best possible results! Download pre and post treatment instructions for laser hair removal: here. Equals Better Savings! Purchase 5 treatments and receive the 6th one at 50% off! After your package is complete (6 treatments) and your treatments have been consistent, you can expect to have a minimum of 75% permanent hair reduction. Exceptions may pertain to areas such as: face and back, as hair growth in these areas may be stimulated by hormones. After your 6th treatment, receive 50% off the per treatment price forever! If you want long-lasting hair removal, schedule laser hair removal at Fresh Laser Skin Studio in NW Calgary today! You can get started by either booking online or by giving us a call at (403) 264-4494.